The U.S. holiday season saw strong sales all the way through to the New Year, despite stock market turmoil and the government shutdown. Increases were seen in both brick-and-mortar stores and e-commerce sites. By all accounts, 2018 was a strong year. De Beers’ surveys showed an increase of 4.4% for the season in diamond jewelry sales over last year, and the National Retail Federation forecast overall retail sales growth of 4% to 5% over 2017. In early November, Tiffany’s announced that same store sales were up 5% for the year in North America and 7% worldwide for the first three-quarters of the year. The company expected holiday sales to continue in line with this number. Signet Group, which operates Kay Jewelers, Zale Corp and Jared Stores, was predicting a flat holiday season as the company recovers from management turnover, difficulties with its credit operations and retooling from its shopping mall orientation. Independents seemed to outperform large chains. The Centurion survey of luxury retail jewelers found that 34% of independent retailers experienced sales gains of 10% or more during the week before Christmas compared to 2017, while an additional 24% saw increases of between 6% and 10%. These increases were consistent with the full month between Black Friday and Christmas. Two-thirds of the jewelers surveyed reported that sales were up for the entire year compared to 2017, and slightly more than half of those had rung up increases over 10%. While one-third of jewelers in the Centurion survey reported sales declines for the final week of the season, only 18% were down for the entire year. One potentially worrisome trend: While the majority of sales were below $2,500, millennials accounted for only a fourth of their sales on average. Most jewelers surveyed, however, did only a small percentage of their sales online. This dichotomy in retail sales – some retailers growing while others slow – will only widen, according to a report from McKinsey & Co. It cites the numerous store closings and the possible dissolution of the once too big to fail Sears. The obvious disruptor, of course, is online sales, but it is going deeper than that. Beyond the obvious, that most retail sales growth will be online and that retailers must embrace “omnichannel” selling, there are a number of other, equally important trends going on. For example, millennials and Generation Z consumers are skeptical of large corporations and established brand names and are opting for newer, “fun” brands that appear to be transparent, approachable and socially responsible. In addition, some e-commerce sites link consumers directly with manufacturers of luxury goods, while other apps can automate the online search and purchase process. In short, purchasing decisions will more and more be accomplished with help from artificial intelligence and automation. Retail business in China has been hit by the trade war with the U.S. and the world stock market gyrations. 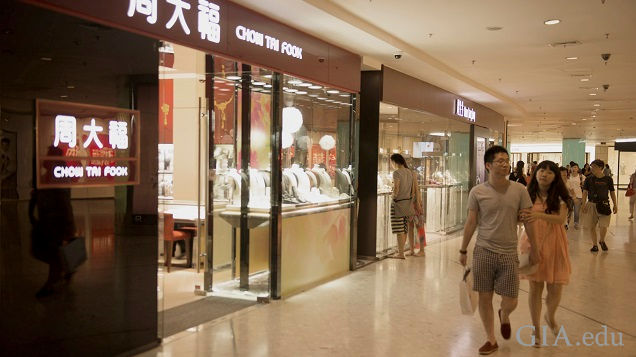 Chow Tai Fook, which accounts for nearly 10% of jewelry sales in Hong Kong and China, reported its same store sales fell 7% on the mainland and 6% in Hong Kong and Macau during the final quarter of the calendar year. “Gem set” jewelry sales fell 5% and 8%, respectively. November retail jewelry, watch and clock sales in all sales outlets fell 3.9% in Hong Kong, said the Hong Kong Trade Development Council. De Beers will probably return to the market with a large Jan. 21-24 rough diamond allocation after a successful season. Russia’s Alrosa announced it sold $4.41 billion worth of rough diamond in 2018, a 6% increase over 2017. Sales slowed, however, in final quarter of the year because of a glut of smaller diamonds in inventories and a continuing tightening of bank credit to diamond manufacturers. Alrosa has scheduled its January sales for Jan. 14-15. The trade will be watching these sales because, while retail demand was good, there are still significant challenges within the middle of the diamond pipeline – continued oversupplies of small diamonds and an ongoing credit shortfall that has pushed a number of firms to the brink of bankruptcy. Ronnie Vanderlinden, president of the International Diamond Manufacturers Association, said these problems will carry well into the new year. One reason credit will not be getting any easier despite improved market conditions is that international banking regulations have not eased up. “There are a lot of regulations and the penalties for violating them are very high, so a lot of banking officials say ‘why bother?’” Vanderlinden said. Production costs for a one carat lab-grown diamond have plunged from about $4,000 in 2008 to $300 to $500 today, according to a recent Financial Times report. This makes it possible for De Beers’ Lightbox one carat diamonds, priced at $800, to be made and sold at a significant profit. The report also said that lab-grown diamonds comprise about 2% of the market (by volume), but this is expanding 15% to 20% yearly. It also noted that the average lab-grown/natural discount is about 43%, compared to 29% at the beginning of 2018. De Beers’ CEO Bruce Cleaver noted in the report that margins for lab-grown diamonds have been unsustainably high. De Beers said it will spend about $100 million making and marketing Lightbox lab-grown diamonds over the next four years, compared to $10 billion of capital spending and marketing for natural diamonds. Citing shortages in supply, the Diamond Foundry announced it was raising wholesale prices on its lab-grown diamonds by 15% in January. The company sells stones of less than one carat for $1,000 or less per carat, but larger lab-grown diamonds, which is calls certified-unique, are priced about half the cost of comparable natural stones. Both De Beers and Diamond Foundry expect to have new production facilities open by year’s end to meet the growing demand.